Many of them have passion in their life, but it is not possible to land their dream job. There might be several issues that stop one to fulfill their passion. The passion with cars can turn out to be a good job prospect. One can grow in the job which they love the most. Automobile manufacturing is the most interesting job, designing a car, making a bill of materials, and assembling is quite a fun part. It deals with different technologies, so most of the engineers who love cars will enjoy a lot. Mentioned here are few jobs for car lovers. It is not easy to get the job at whatever they love, people play with cars in their childhood. Some people will treat it as a passion, to grab a job in automobile industries, one need to study related course so that he/she would be able to get a job in that sector. Interviewers will not only check knowledge of the candidate but also they look deep into their excitement with products. Passion would drive anyone crazy, in this industry one will have huge scope to develop. In the market there will be always needed of cars, so automobile industries keep launching new models. They would require a talented person to handle these car manufacturing. Car racing can also be chosen as a career. People who would love to have fun in their life generally chose these as careers. Motor racing courses are offered in a wide range, the competitive spirit is necessary to be part of it. One will be paid with huge remuneration if they win the competition, also through practice is necessary to win the race, but the retirement is early in this field, the one who will exhibit their performance to take the cup, they would be paid highly which is most interesting part. But the risk is also involved in it, unless they are experts it is not an easy job. One who has a relevant educational background in marketing, can go with this job. Marketing executive or marketing manager is also a quite interesting job, they deal with marketing products, a good knowledge about products will help them to be a hero in this field, one can grow their career with a drastic change by showing their skills at excel. Communication skills, ability to explain about their products, and grip about the sales, position of the company brand all these knowledge would require to attract a customer. People who love cars will love this job. They feel interesting to talk about what they like, thus improving sales. Manufacturing is not everyone’s choice. Some will have an interest in human resources, which is the common and key department in each and every organization. Also in car manufacturing industry it is essential to have human resources executives and managers. One need not to be a engineer to fulfill their love towards cars. This department is also an interesting part of the car industry; one will even have opportunity to shuffle to the core department their career. So opportunities are flexible once they are part of it. It is easy to grab the lead roles in the industry with hard work. Mechanical/Automobile engineers design parts of the cars and also provide drawing for assembling. This would deal with new innovations, cost saving, efficient working principle. To sustain in the market, any industry will require fresh ideas and new designs to blow out in the field. So design engineers will be the major part of any car industry. Their requirement in this field plays a key role. They will be paid with huge salaries and provide with all business class industry facilities. Passion can be used to grow their career. If the designs proved successful, not only they will be part of history but will also be queued with many opportunities. Loving the job and making money out if it is a great achievement in someone’s life. A person with interests in cars has to deal with the car repairing, maintenance, testing etc. It involves troubleshooting and fixing/assembling parts. Graduation is required to work as a technical executive in the automobile industry. The technicians will have the opportunity to understand the mechanism of different cars. A decent salary will be provided so both the needs employment and passion are fulfilled. Dealership is also one of the best job opportunity with cars. This is the great place to get profited. They sign a contract with automobile industries and will distribute the cars. It also includes maintenance, service, sale of spares etc. They deal with the local car sales. They will be aware of new models launched in that brand. Education qualification required is business management. They had to make better sales to grab the place in the market. In this field they can make most of the money. Even knowledge in insurance will help to get opportunities to deal with cars. The new car owners will generally look for an adjuster to make an insurance policy for their car. The adjuster will help the client with the policy and damage that can be covered against that particular car. They deal with lots of clients and different models and different brands, in this way also one can enjoy his love towards cars. The adjuster can grow his career slowly to a dealership owner. So there are wide opportunities in this career. Yes, you will actually be paid to test drive the best of cars. These basically mean supercars from brands such as Lamborghini, Ferrari etc. The best part about this is that you will be the first one to ride the car before anyone else drives it. It is your responsibility to drive it and prove how safe it is. Though landing this job is not easy as you will have to get yourself some schooling and specific degrees and also years of practice to get this job. Once you land this job, it will prove to be the most happening thing in your life. This one is the best for those who love to travel and also love cars. You will get the opportunity to get to know about the latest cars at the earliest. You may also get to see the building up of a car even before it is ready to hit the market. Automobile journalism will bring you closer to cars and you will also gain a lot of knowledge as you study and write about cars. This is a very prized position and the payment is very good if you are an enthusiast and do your job to the best of your abilities. You will also need to polish up your writing skills a bit. This job is only possible if you are very passionate about cars and money is a secondary factor to you, as this job involves rebuilding and restructuring old or damaged cars. You will have clients bringing their car to your workplace and ask you to repair certain parts too. Many might just leave their car for months and not answer your calls too. Therefore, you need to be satisfied with whatever you have. But in some months when you get high grade cars you will have a lot of profit. After some experience you can start your own business or a dealership which will pay you immensely. If you are an engineer who has a passion for cars, this might be a great opportunity for you as you will have to build engines for the cars all day and also assemble them. It is like you are making the heart of any car. Though most low budget factories have noisy grueling conditions, top notch factories are much peaceful calm and slow with their work. Therefore, you will really enjoy building and assembling engines here. For this too you need a lot of experience and a good degree certificate on car engineering and building. A salesperson’s job in the automobile industry is pretty self explanatory as you will have to do what all salespersons do, i.e is selling but this time you will have to sell cars. Selling cars is a joy in itself, as salespersons, also sometimes, gets the opportunity to test drive the cars for their customers. A basic knowledge about the features of the car you will sell is enough to land this job. This is an exciting job for every car lover as you will spend your whole day surrounded by exquisite and top notch cars. If you are a good writer and have event management and planning skills along with a love for cars, you could work as a public relation manager or officer with any car company. Though getting this position in top brands will need a lot of experience. Your work would be to take important decisions regarding the brands face and popularity among consumers. You will be allowed to attend all exclusive car shows, plan and reveal new car concepts and also be a part of the advertising and marketing group. A service advisors job is an exciting one as you will get a very good pay and also a huge lot of commissions by just giving advice to customers who are willing to buy cars. You just need to guide them to make the best purchase which will serve their needs as well as suit their budget. A lot of sales depend on the advisors of the company but unlike the sales team, advisors do not have to work on the weekends. You can also work as a freelancer as well as answer queries over the phone even if you are not present. All of the reputed and top notch brands that manufacture cars need a financial advisor to know the market better and also to analyze the needs of the market. You will have to analyze the needs of the consumers and basing on that the cars are going to be designed. This is a very rewarding job as you will get to know a lot about various types of cars and also stay around them when you are examining them. You will get chance to work in an office also in the factory, if you wish to. The job of an engineer requires you to have an automobile engineering degree if you want to work as an engineer in any car manufacturing company. You will be totally responsible to look after the designing, assembling and building of the car. Engineers get a lot of respect and are well recognized as they are the masterminds behind the successful running and good looks of any car. You will be the builder of the car. It has a lot of hard work but the pay is up to the mark. Therefore it is a good opportunity for any car lover. For many of them, it’s a dream come true job with cars. So above careers might help them to lay path for their career and enjoy the work place environment and get opportunity to deal with what they love and can land jobs with relevant educational qualifications. Always remember that a job that pays you well may not always keep you happy and give you a peace of mind but your passion as a job will surely give you happiness and peace of mind even if it pays you less. Therefore choose wisely. 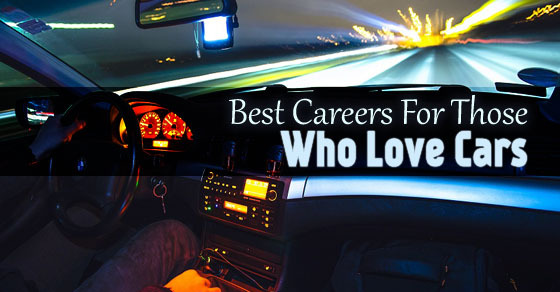 These jobs all pay well and also will keep you happy as a car lover. Next articleHourly Vs Salary Employees – What is the Difference?